Named after the “serrated mountain” of Montserrat located near Barcelona in Catalonia, Spain, the Benedictine Abbey of Santa Maria de Montserrat is as breathtaking as its setting. Among the thousands of visitors on the grounds of the abbey on Wednesday the 18th of May 2016 I actually saw one of the resident monks walk into the basilica. This drawing, which has helped smooth out some of my jet lag, is based on a photo that I took with my iPhone. Procreate, iPad Pro, Apple Pencil. 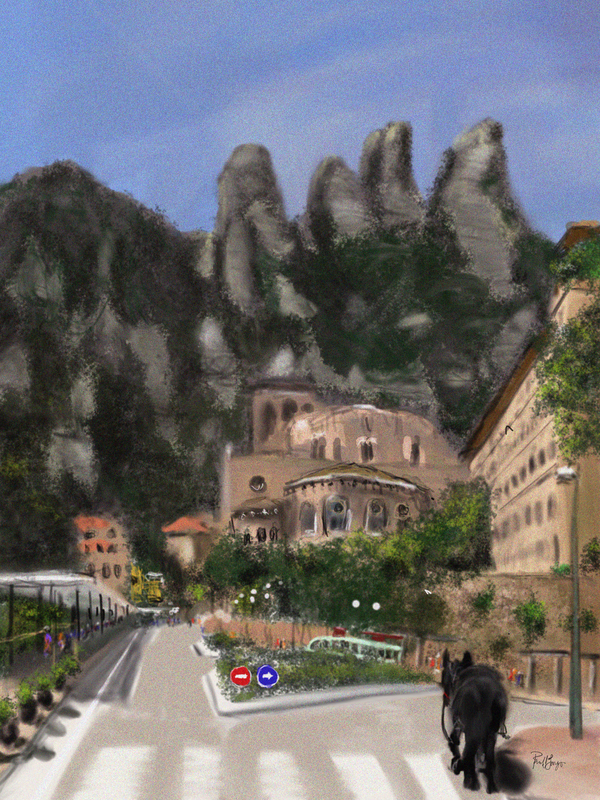 This entry was posted in Digital Artwork, iPad Art, Sketches, Video and tagged Barcelone, Benedictine, Catalonia, monks, Monserrat, Procreate, Santa Maria de Monserrat, Spain by portfoliolongo.com. Bookmark the permalink.